The honey bee, Apis mellifera, is the most important pollinator of agricultural crops. Honey bees pollinate over 70 out of 100 crops that in turn provide 90% of the world’s food. They pollinate most fruits and vegetables — including apples, oranges, strawberries, onions and carrots. But while managed honey bee populations have increased over the last 50 years, bee colony populations have decreased significantly in many European and North American nations. Simultaneously, crops that are dependent on insects for pollination have increased. The phenomenon has received the curious designation of Colony Collapse Disorder (CCD), implying it could be caused by any number of factors. Serious recent scientific studies however point to a major cause: use of new highly toxic systemic pesticides in agriculture since about 2004. If governments in the EU, USA and other countries fail to impose a total ban on certain chemical insecticides, not only could bees become a thing of the past. The human species could face staggering new challenges merely to survive. The immediate threat comes from the widespread proliferation of commercial insecticides containing the highly-toxic chemical with the improbable name, neonicotinoids. Neonicotinoids are a group of insecticides chemically similar to nicotine. They act on the central nervous system of insects. But also on bees and small song birds. Recent evidence suggests they could also affect human brain development in newborn. Today more than ever, the world’s food resources are being hijacked by giant corporations that are turning farms into factories and replacing natural resources with genetically modified “food-like” substances. 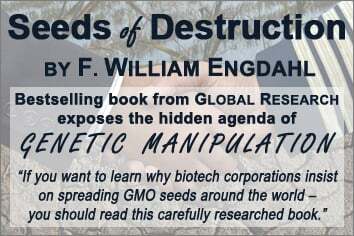 F. William Engdahl is a leading researcher on the destruction of the planet’s food system and the profit-driven enterprises that are driving this devastating process. 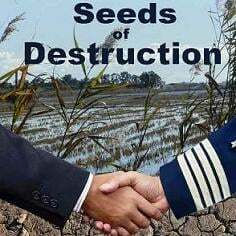 To learn more, pick up your copy of “Seeds of Destruction: The Hidden Agenda of Genetic Manipulation“, published by Global Research. Now also available in PDF format. Ordering from Canada or the US? Find out about our special bulk offers for North American customers! Place your order online by credit card, through PayPal or by mail!